A Livejournal blogger’s provided photos and comments on today’s meeting of airborne and other veterans on Poklonnaya Gora. 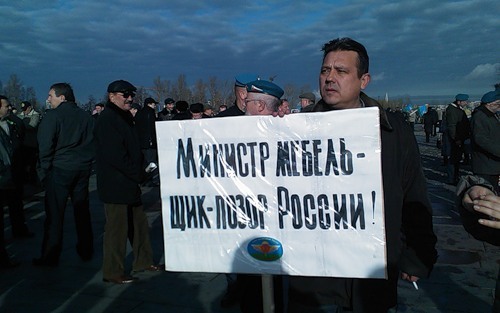 Organized by former VDV Commander Achalov, the protest is dedicated to denouncing Defense Minister Anatoliy Serdyukov and his reforms. The blogger puts the number of demonstrators at less than 4,000. According to Lenta.ru, current and former VDV generals have appealed to airborne veterans not to get into it with the Defense Ministry. They included current chief of staff, Nikolay Ignatov, former Commander Georgiy Shpak, and former First Deputy Defense Minister Aleksandr Kolmakov. An address from VDV Commander General-Lieutentant Vladimir Shamanov, who remains in the hospital following last weekend’s car accident, was also read. Sounding like the ultimate devotee of civilian control of the army, Shamanov said Serdyukov is making long overdue changes at the Supreme CINC’s direction. He denied the VDV has lost any combat capability due to Serdyukov’s reforms and again promised it’ll remain an independent branch, receive new weapons and equipment, and get two more formations. He told airborne men ‘not to believe loud, but misleading announcements about how the VDV’s combat capability will supposedly decline.’ He said corrupt people of all stripes and so-called oppositionists are against the army’s renewal. Shamanov called on delegates to this ‘conference’ of the Russian Airborne Union not to allow themselves to be dragged into an unnecessary confrontation with the Defense Ministry. This entry was posted in Military Leadership, Officer Corps, Serdyukov's Reforms, VDV and tagged Anatoliy Serdyukov, СДР, Союз десантников России, Russian Airborne Union, Vladimir Shamanov. Bookmark the permalink.